Dr Wilma Tabacco is an artist who has exhibited extensively in Australia and overseas. 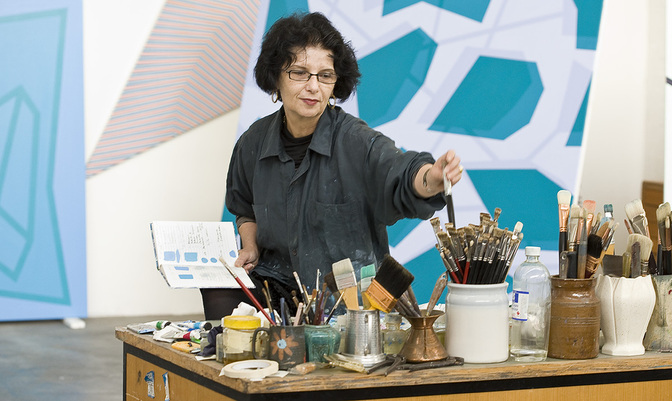 She has presented 31 solo exhibitions since 1988, 12 of which have been held at Niagara Galleries in Melbourne and 8 at Helen Maxwell Gallery in Canberra. Wilma has also participated in 140 group exhibitions since 1981. Her work has been acquired by major museums including National Gallery of Australia, National Gallery of Victoria and Museum of Modern Art (Heide) and by private collectors in Australia, Italy, France and USA. She has been the recipient of several grants including 3 from the Australia Council, an AsiaLink residency in Seoul, Korea and grants from Art Victoria and Nets Victoria. Her work has been written about and reviewed extensively in magazines and books, in local and international print media and she has conducted interviews for radio and television locally and overseas. Eight exhibition catalogues have been published on her work. Wilma has been an arts educator for most of her adult life working in a variety of tertiary institutions. She has provided guidance and advice to many artists including insights on establishing and maintaining a viable and successful arts practice. As lecturer in painting at RMIT co-ordinating Year 3 and Honours programs, she has curated and organised many Graduate exhibitions. She has also curated several group exhibitions for University galleries. Amongst other qualifications Wilma holds a Bachelor of Commerce from Melbourne University, with honours in Business Administration and Economic History. She gained a PhD from the School of Art, RMIT University in 2006. Born in Italy, Wilma continues to maintain cultural, historical and family links with her ancestral origins but she values and enjoys the opportunities and life style provided by Australia, her home since childhood. "In some ways the most effective and memorable series in this exhibition is the series of excavations and remnants and the towering achievement of the large, major oil painting, Sesame (2015). In some ways this is classic Wilma Tabacco – sophisticated, witty and brilliant in the conception and execution of her paintings. There is a deceptive simplicity, where nothing appears exactly as it is meant to be and as you explore the forms you are increasingly consumed in a sophisticated visual game with line, space and illusion. The tumbling linear forms appear as if suspended in space with an implied dynamism in their structure. Many of the paintings appear as self-contained fragments, where the artist plays with found or invented forms, that are subtly and immaculately depicted and presented for our contemplation and that provoke us to put them together into a bigger and more completed whole." "Although the title of Melbourne artist Wilma Tabacco's​ latest body of work may draw connections to a culture of the early Bronze Age, the paintings, reliefs and works on paper in Cycladic might be read as an expanded form of minimalism. But her seemingly flat, interlocked colour planes, striking black motifs and gently glinting reliefs – comprising hundreds of circular, metallic discs or petals affixed to wooden board – shift and transform with time and vantage. The black formal gestures that anchor several of her paintings assume the guise of a kind of abstracted figuration. 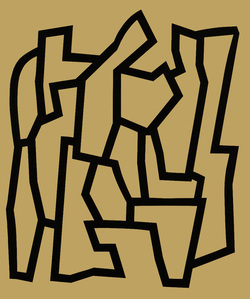 Others take the form of interlocked geometric shapes, like throngs of silhouettes. The play between abstraction and the evocation of the figure is magnetic. Tabacco's painted surfaces aren't nearly as flat as their first read. With proximity, their patina and the play of the brush become far more complex. Similar qualities belie her metallic works, the components of which reveal themselves to be cut-up paint tubes and wine-bottle seals."